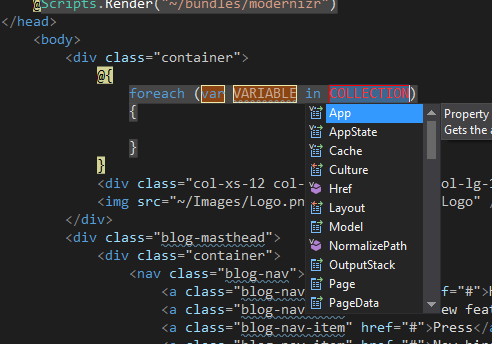 Probably, the most commonly used snippets are those which appear for Visual Studio keywords. Things like creating properties, foreach loops etc. Go ahead and try it. Open a blank C# document and type foreach, then press the TAB key. See what happened? Visual Studio did the hard work for you and added all the code required for the block you wanted. It even did it in a best practice syntax and style. You can create your own snippets like this. And I would use this for almost every HTML element on my page. So I created a snippet that handles this for me. I use the shortcut text of bsclass, which I type then press TAB. The snippet inserts the entire class attribute and values into the document at the position of the cursor. That has to save me at least a minute on each HTML element. The snippet file is an XML document. Open Notepad and copy/paste the below text (you will have to make some edits for your own snippet text. Once you have updated the document, you have to save it to a particular location on your machine. That location is %UserProfile%\Documents\Visual Studio 2012\Code Snippets\Visual Web Developer\My HTML Snippets. This code will work for your machine if you are using VS 2012. NB: Replace the Visual Studio 2012 section of the text accordingly if you are using a different version of VS.
Once you have saved the file, you should be able to type the text that you entered in the Shortcut attribute of the XML file and your Snippet Code will be inserted.